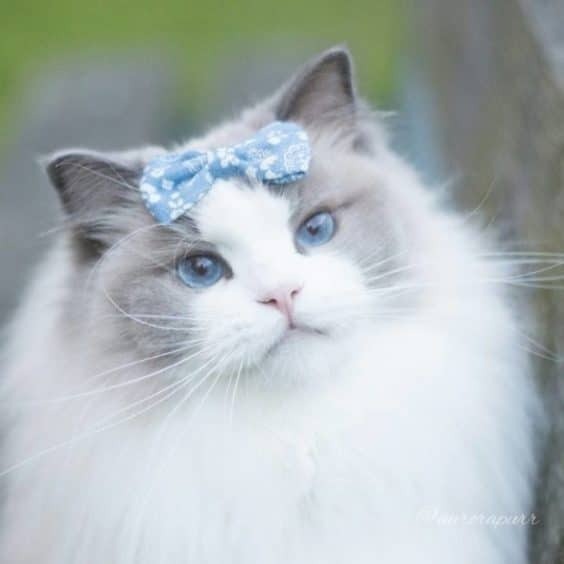 Meet Aurora cat, a blue-eyed bi-color ragdoll from Stockholm, Sweden. 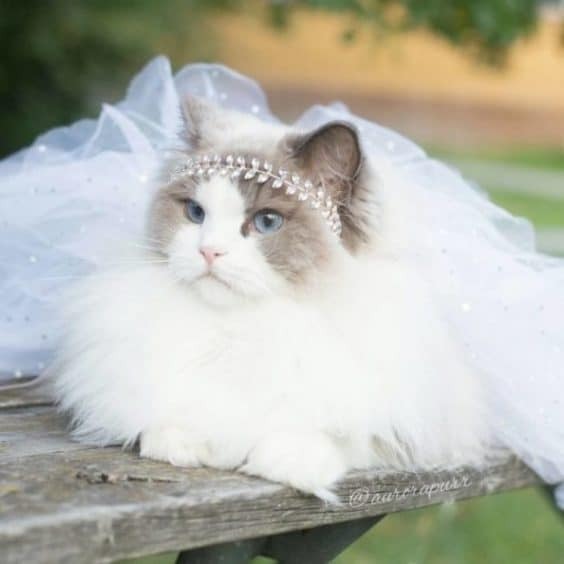 This beautiful queen of cats was named after the original sleeping beauty. 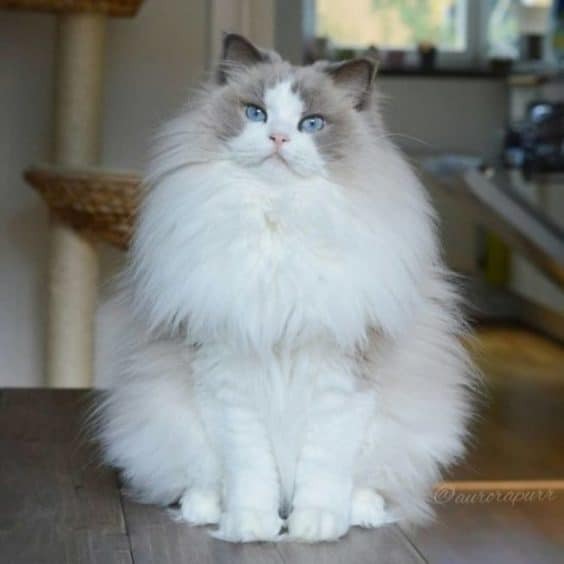 Aurora has the distinction of being the fluffiest and the most beautiful cat princes ever. Princes Aurora is a true royalty. 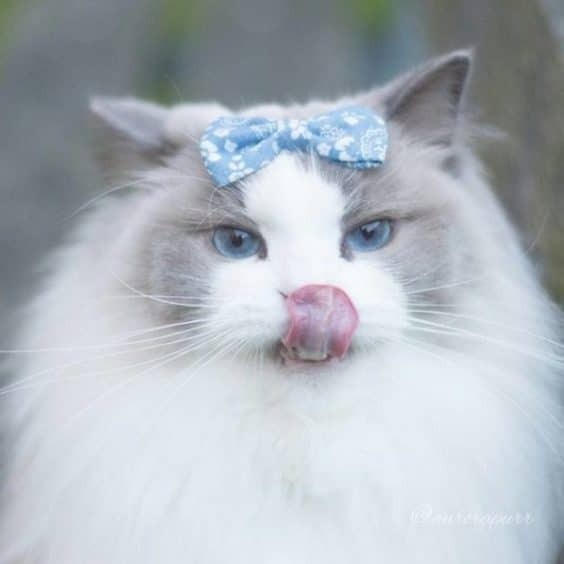 The blue Colorpoint ragdoll has a nickname “Philly” and her fans call her “Handsome fluff Monster”. 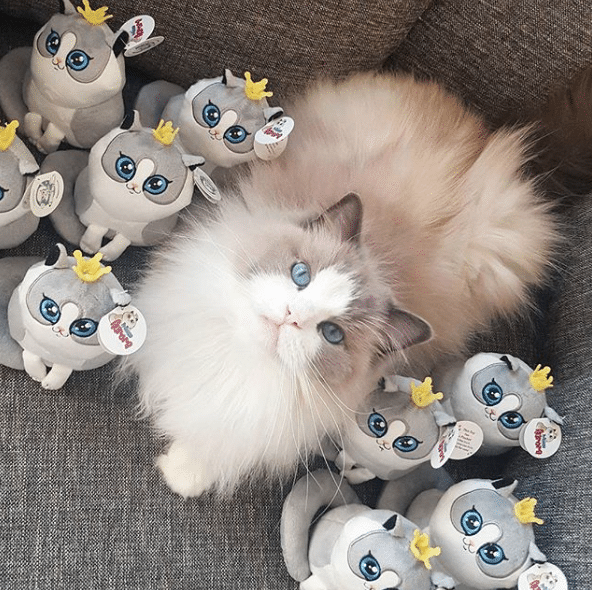 Cats are well-known for being the rulers of the house, but Aurora cat takes it to the next level, according to Emily and Niklas, her owners. 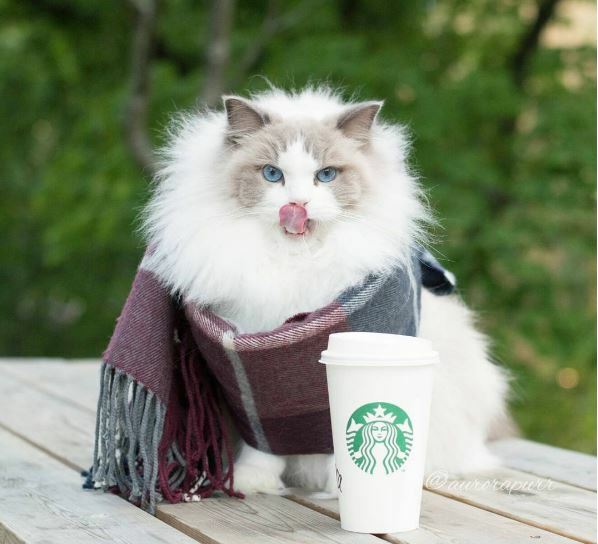 Ragdoll is a breed developed by an American Breeder Ann Baker in the 60s. 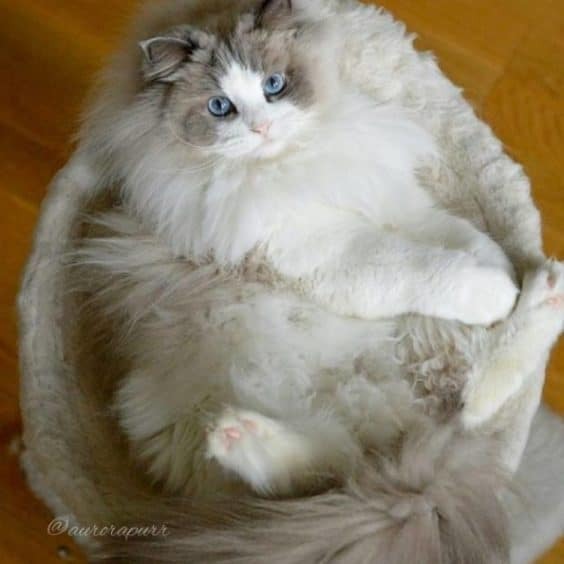 It is a breed with bright blue color eyes and a unique color point coat. 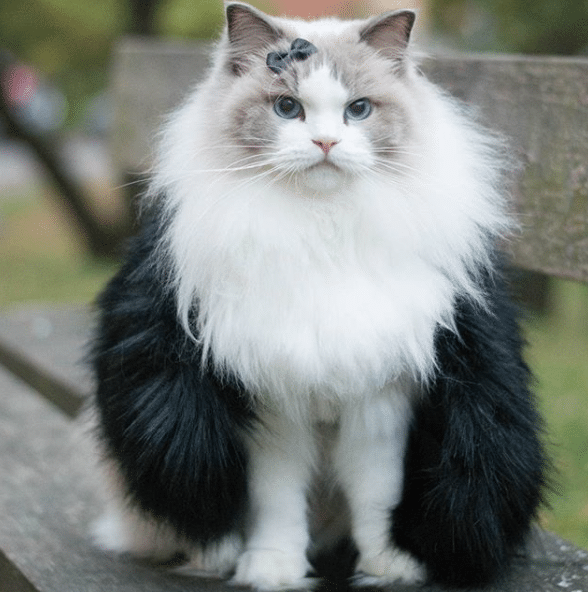 This is a semi-longhair cat with a silky and soft coat. These breeds are famous for their docile nature and affectionate and loving personality. Princess Aurora cat lives with her human parents and a kitty brother Prince Phillip. At a very young age, this queen cat had a unique royal personality and an affinity for camera, which is quickly identified by her parents. Having seen her personality and beauty, her parents decided to open an instagram account in her name and now she is a huge star on the internet. 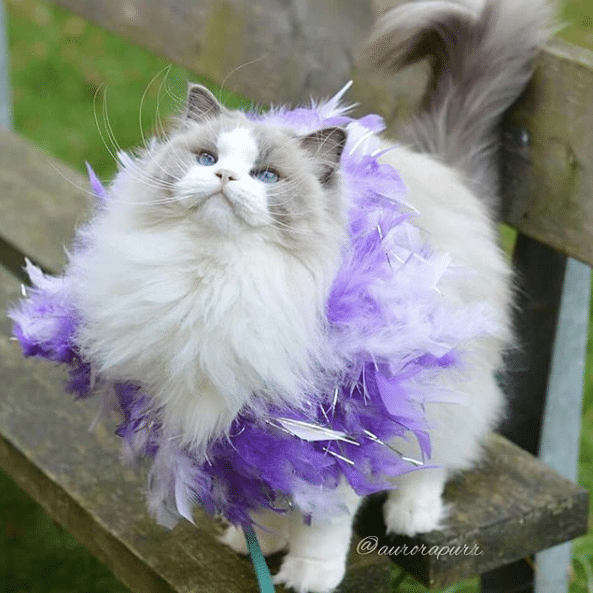 Aurora cat has more than 225,000 followers on Instagram. 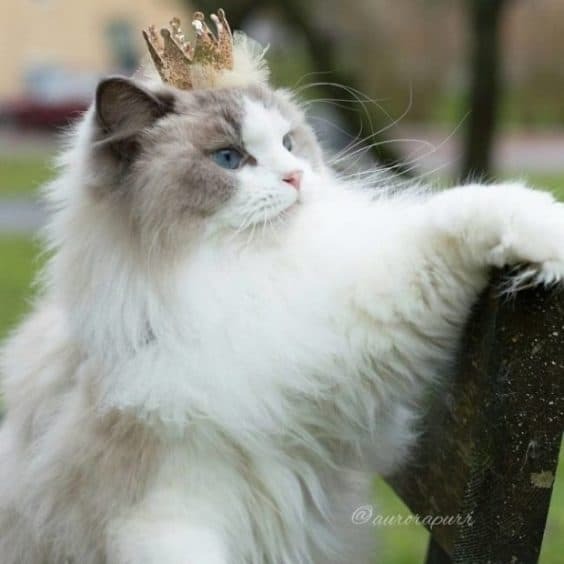 This self-styled and worlds royal cat has dedicated fan base. She takes part in various product endorsements and even has people creating fan art for her. She has featured in a Swedish 30 second Commercial on the social media for a Swedish company Kattbox. 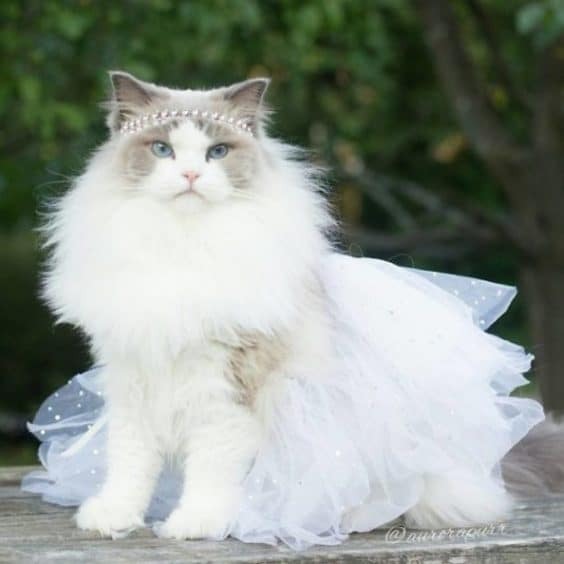 According to her human parents, Emily and Niklas, the world’s most royal cat is something of a diva. Aurora cat knows she is pretty and her mannerisms convey the same. She wants things to be either according to her wish or she won’t co-operate. It’s her way or no way. Like a royal, she loves relaxing, eating, sleeping and getting pampered. Unlike the Royal behavior, Aurora is not arrogant or smug, but Infact, she is quite an opposite. She is very lovable and loyal cat. She gives her owners the same amount of love that a dog can give and this is a fact. 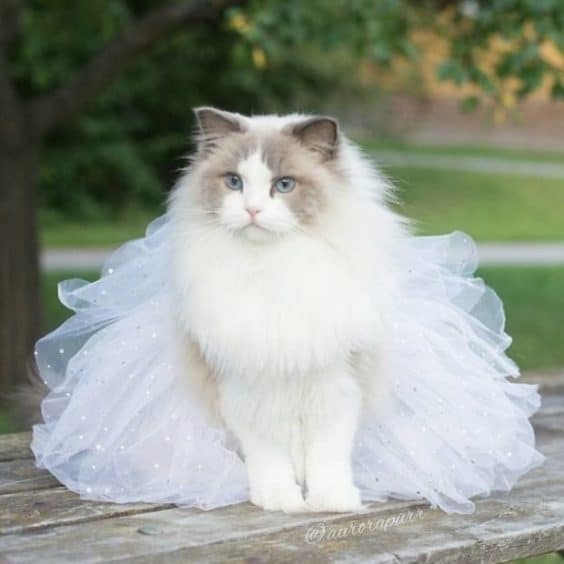 Ragdolls are famous for their dog like personality traits and due to this personality they tend to follow their owners around, they love being picked up and are good with other pets in the house. They show very little aggression. All of these traits can be found in Aurora that makes it a lovable cat. Her fur is so beautiful that they have been blessed. The most favorite hobby of Aurora cat is posing for the shutterbugs and modeling for the latest clothing’s. Like a Royal she has a great sense of dressing and is always appropriate for the occasion. She even has a friend by name Prince Phillip. 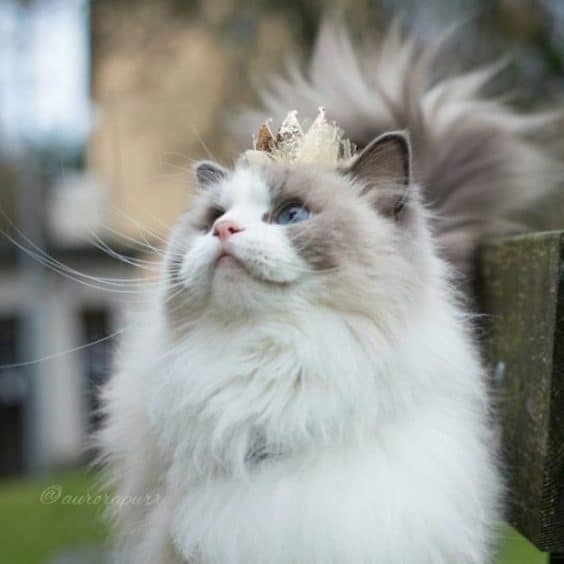 The world’s most royal cat is not afraid to try out new fashion trends and is courageous enough to flaunt them. She knows how to pose for the cameras and according to the costume she is wearing. Like any professional she never complains and is ready for the photo shoot in an appropriate costume. She has her own bed with a fluffy pillow like a royalty and doesn’t sleep in a basket. Whenever, Emily and Niklas, upload any of her new pictures on her instagram account, she instantly gets thousands of likes. Her fans love her a lot and are eager to see her new pictures. The way she poses for the camera is just unbelievable. It is almost impossible to believe that this is just a cat. She is very much at ease in any dress and any pose. Her different poses are a proof that she loves being photographed and knows that she is not only famous, but also a huge star. 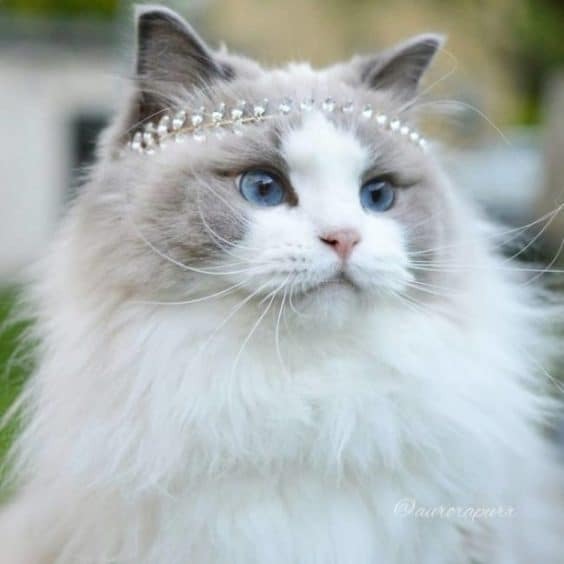 The photos of Aurora cat in a tiara is just adorable and has thousands of likes and hundreds of comments, congratulating this beauty. 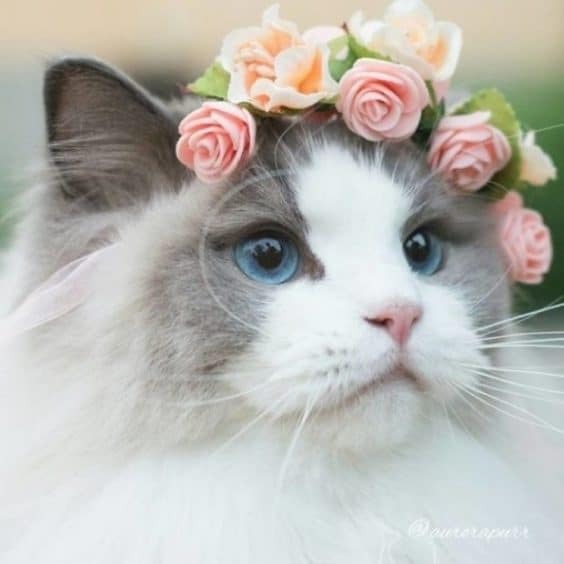 Not only precious stones, she has even looked gorgeous in a flower tiara. In one of the images we can see her loving side, where she is seen taking care of her brother cat Prince Phillip. 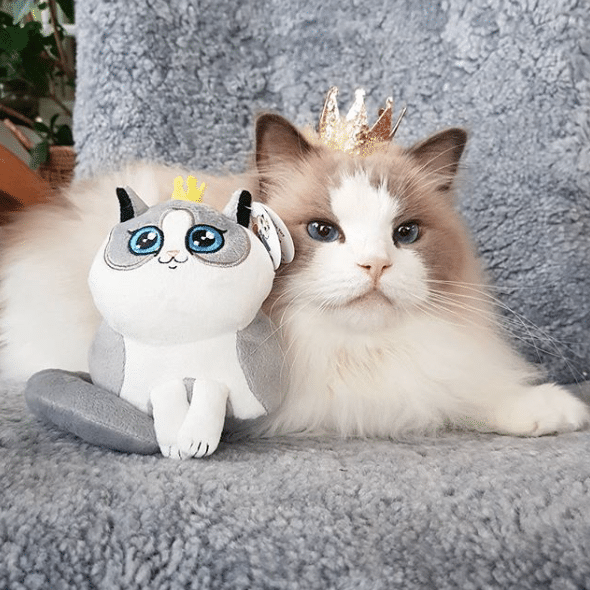 This princess cat is so famous that there are various merchandise available in the market of her name that sell like hot cakes. 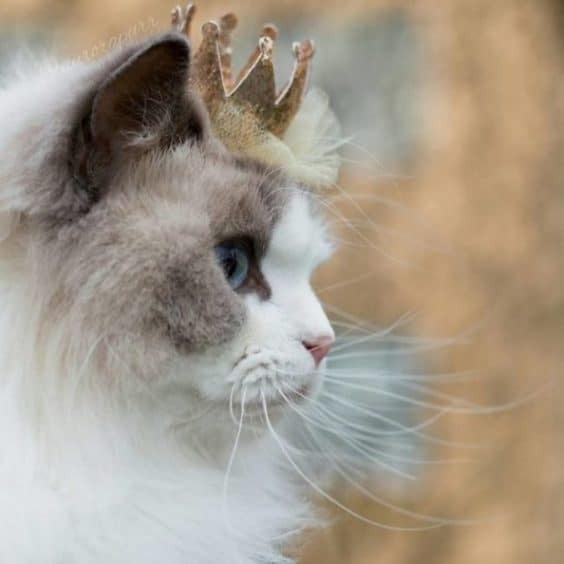 The world’s most royal cat, the Aurora cat is indeed a pretty and lovable cat. The way she looks and poses for the camera is unbelievable. She is very patient and happy to try out new costumes for each photo shoot. This royal beauty has taken the world by storm because of her calm nature and natural diva like beauty that is loved by all her millions of fans.